When the Bishop of Exeter (Dr R C Mortimer) celebrated Holy Communion at Clovelly Parish Church on Sunday morning he was the first Bishop to do so there within living memory. After his address the Bishop confirmed six candidate, all from the parish, and these were among the first to take Communion as the service continued. This procedure goes back to the very early centuries of the Christian Church. The candidates, ranging in age from 13 to the late 40s, were presented by the Rector (Rev R O H Eppingstone). The future of Clovelly's picture postcard harbour and the safety of its beachside cottages could be threatened unless action is taken quickly to repair the breakwater which protects the centuries old harbour wall it was warned yesterday. A repair scheme could cost upto £30,000 and the problem is who should pay the bill. The harbour is owned by the Clovelly Estate Company and its managing director, Captain M W B Kerr, told the Gazette this week: "We cannot afford to pay for the work." By seven votes to five the annual parish meeting at Clovelly rejected a move to inquire into the possible provision of light mechanised transport up and down the famous cobbled, stepped High Street. Putting forward the idea, Mr Stan Nicholls said he thought it to be possible to provide some kind of transport. It would relieve the difficulty over the delivery of items such as coal. Mr J J Headon agreed that the move would solve a lot of problems. Many friends attended the funeral at All Saints' Church, Clovelly, of Mr Francis Stephen Headon, 64 The Quay, whose death at 81 occurred suddenly at the united New Year Watchnight Service at Clovelly Methodist Church. The Rector, Rev R O H Eppingstone, officiated at the funeral service, with Mr Storey at the organ. Clovelly Ladies Lifeboat Guild have raised £3,406 in the past year for the RNLI reveals the annual statement of accounts. 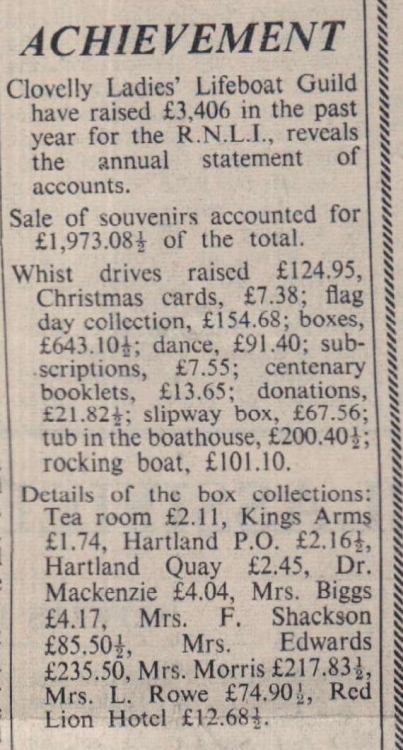 Sale of souvenirs accounted for £1,973.08 of the total. Whist drives raised £124.95; Christmas cards, £7.38; flag day collection £154.68; boxes £643.10; dance £91.40; subscriptions £7.55; centenary booklets £13.65; donations £21.82; slipway box £67.56; tub in the boathouse £200.40; rocking boat £101.10. Total of 14 tables were used at a whist drive organised by Clovelly Conservatives at the School Hall. Mr W Robins was door steward and Mr Nicholls was MC. Prize winners were: Mrs J Bragg, Mrs A Burrow, Mrs Aust, Mrs Wonnacott, Mr Locket, Mr Whittaker, Mr J Burrow, Mr L May, Mr F May, Miss Turner. Prizes were presented by Miss Mullins. In a draw fruit was won by Mrs Cole, while Mr P Ellis held the lucky number ticket. 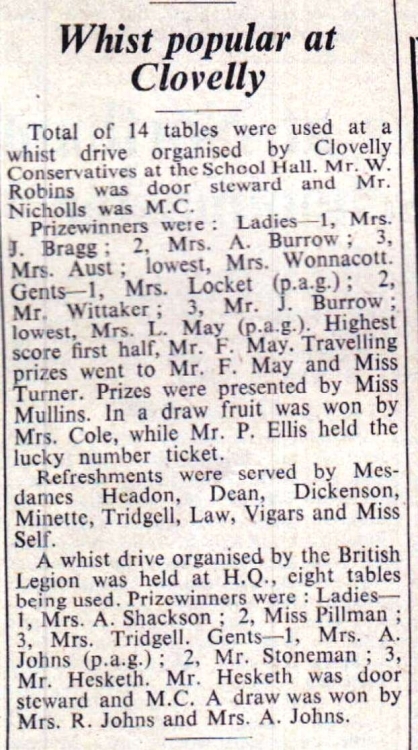 Refreshments were served by Mesdames Headon, Dean, Dickenson, Minette Tridgell, Law, Vigars and Miss Self. Just 12 months after becoming the owner of Clovelly Cross petrol filling station, Mr Tim Stoneman has learned that it has been judgedNorth Devon winner of the Shell Shine '72 competition. Mr Stoneman had managed the petrol station for 14 years for the Clovelly Estate Company. That the Parish Council should form themselves into a skiffle group or should have their photographs taken for sale to summer visitors were two light hearted suggestions made at Monday’s meeting of Clovelly Parish Council during a long discussion on ways and means of meeting the outstanding balance of just over £40 on the Turnpike bus shelter. Recent gales have built up a high, wide, bank of pebbles at Clovelly which has now crept around the end of the pier and is extending in the direction of Bucks Mills. Anxious watch is being kept on this new ridge of pebbles because further movement in the direction of Bucks Mills will make it extremely difficult to launch Clovelly lifeboat especially at low water. 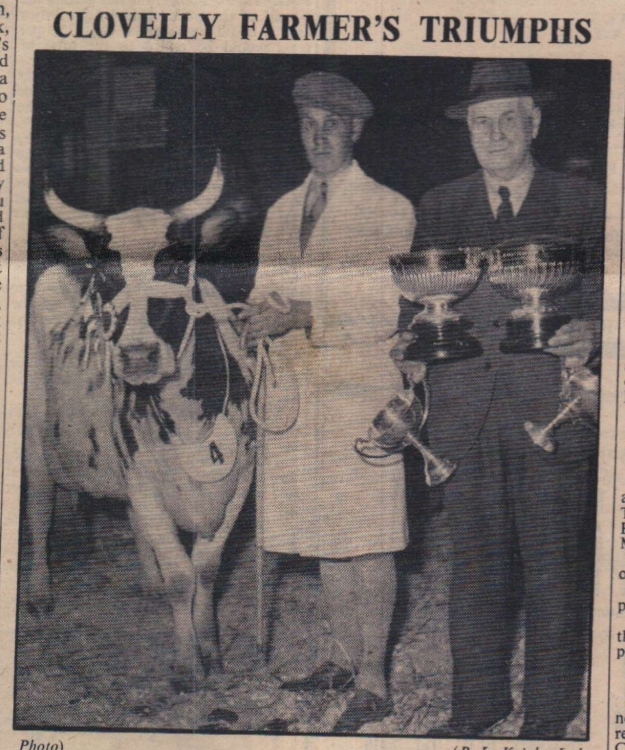 Supreme champion and winner of three other challenge cups at Barnstaple and District’s Dairy Show last week was the four year old Ayrshire cow ‘Dairy Maid’ owned and bred by Mr K F Stanbury, of Downland Farm, Higher Clovelly. The photograph shows Mr Stanbury with the champion while his father holds the trophies. ‘Diary Maid’ was one of the team of Ayrshires which won the breed championship at the show. She gave 11, 240lb of milk as a heifer and his now yielding 7½lb of milk a day in her second lactation. Children from Clovelly Primary School observing the village’s traditional Shrove Tuesday ‘land-sherd’ custom of dragging tin cans on string down the cobbled High Street. The custom, long held in the village but of uncertain origin, aims at driving the devil away from the village for another 12 months with its boisterous noise. Sir – Rumour having been circulated that only certain wholesale buyers are able to obtain supplies from there, and if they were stopped the fish industry of Clovelly, Bideford and District would suffer, allow me to say that for the last 48 years I have travelled from Clovelly and Bucks to Bideford daily, that being my only source of income. 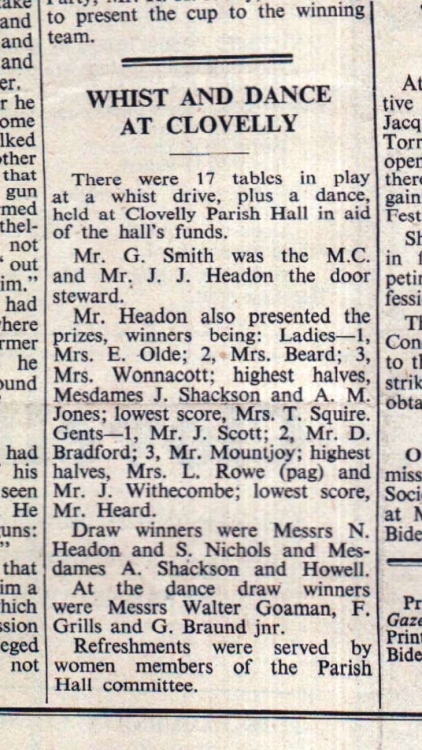 There were 17 tables in play at a whist drive, plus a dance, held at Clovelly Parish Hall in aid of the hall’s funds. 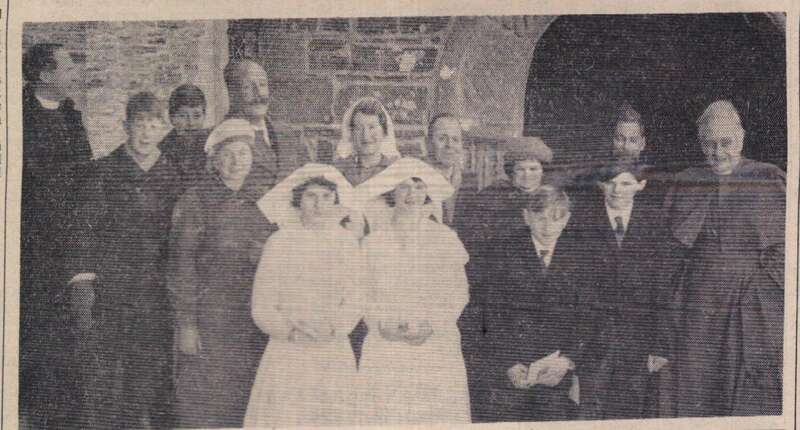 It was a marriage without frills when 23 year old Mr Arthur Beer walked down the aisle and out of Clovelly Parish Church with his bride, Miss Ellen Grace Jewell. The very next day Mr Beer was back at work again because, as he explained to a Bideford Gazette reporter: ‘We just couldn’t afford a honeymoon in those days’. The couple were married on May 20 1908, by the then Rector, the late Rev Mr Simkins, and on Tuesday, which marked their golden wedding anniversary, they received numerous messages of congratulations. Over five-hundred mile have been covered by Clovelly Concert Party in their successful season which has just ended. The high standard of their performances has won much praise from large audiences. Over 20 villages have been visited. Altogether the party raised £358 for various local organisations and they have given shows in an area roughtly bounded by Hartland, Welcombe, Bradworthy, Shebbear, Dolton, Ashreigney, Alverdiscott, Bideford, Abbotsham, Bucks Cross and Clovelly. Highest amount raised at any one parish was £39 16s 1d at Alverdiscott. Nearly 36 years ago a Clovelly man sailed the day after his marriage for a new life with his bride in New Zealand. Now, back again in North Devon for the first time since, 68 year old Mr Jack Slee said he was ‘absolutely stunned’ at the present day prices of land and houses. 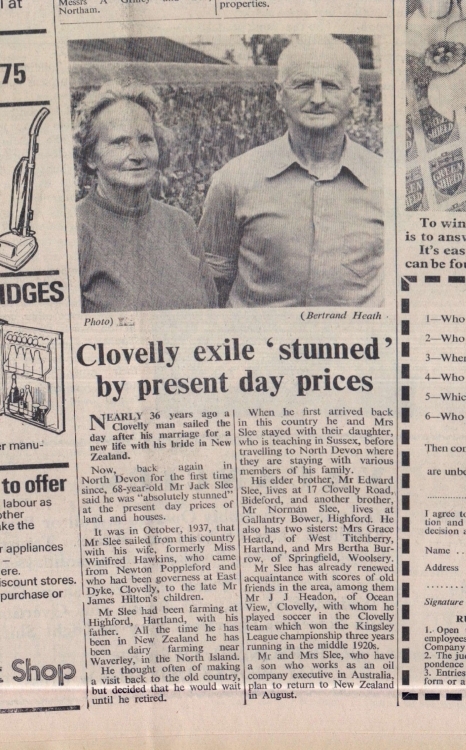 It was in October 1937, that Mr Slee sailed from this country with his wife, formerly Miss Winifred Hawkins, who came from Newton Poppleford and who had been governess at East Dyke, Clovelly, to the late Mr James Hilton’s children. Capt A Sowman, secretary, receives on behalf of the Clovelly branch of the RNLI, a cheque for £500 from Group Capt I M Pedder, commanding RAF Chivenor. The school had been very happy under her direction and had secured more places to other schools than in any previous year. This was a tribute paid to Mrs A M Jones by Mr James Cruse, the senior school manager, when Mrs Jones, headmistress of Clovelly primary school, retired after eight years. The Rector of Clovelly, Rev Dr G S Spinks, said it was an occasion of mingled regret and gratitude. The school owed much to Mrs Jones’s constant interest and effort. Mr Charles Shackson of 59 The Quay, Clovelly, who has retired after 45 years with the local lifeboat became a crewman at 18. When, at the meeting of the Clovelly branch of the Royal National Lifeboat Institution, he was presented with the long service plaque, it was stated that during his association with the lifeboat it had rescued 53 people. A meat whist drive held at the Parish Hall and organised by the Clovelly Liberal Association made over £11 profit. M.C was Mr G Smith with 14 tables in play. Mr K Braund was door steward.